On my recent airplane trip, I took only carry-on luggage. That meant not taking my regular toothpaste, because it was too big. 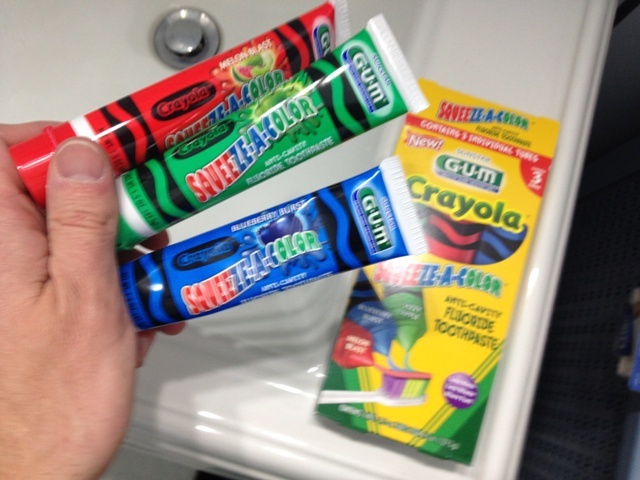 Fortunately, I had some smaller tubes: I had just recently bought some Crayola toothpaste. I originally bought it because it did have fluoride, and did not have sodium saccharin. It’s a hard combination to find. It is a three-tube box containing Blueberry Burst, Melon Blast, and Jazzy Apple. I took the blueberry flavor because I knew I would like that. It was indeed good. Last night I decided to taste the melon and apple flavors. I didn’t like them. To be fair, I must say I don’t like artificial melon and apple flavors. I would have preferred them to be cherry and lime or something. And if there were such thing as grape? Mmm… that would be the best. I am glad I had the blueberry for my carry-on, but I will not buy this toothpaste again, because I will end up throwing away two thirds of it. Ha! That is crazy! Have you tried them all at once like the picture on the box? Then it would be like fruit salad. Bad, bad, soapy fruit salad. Promise me you’ll try it. Now why don’t they give you the primary colors so that you can blend the flavors? Maybe if you use this toothbrush, it will distract from those 2 horrible flavors.